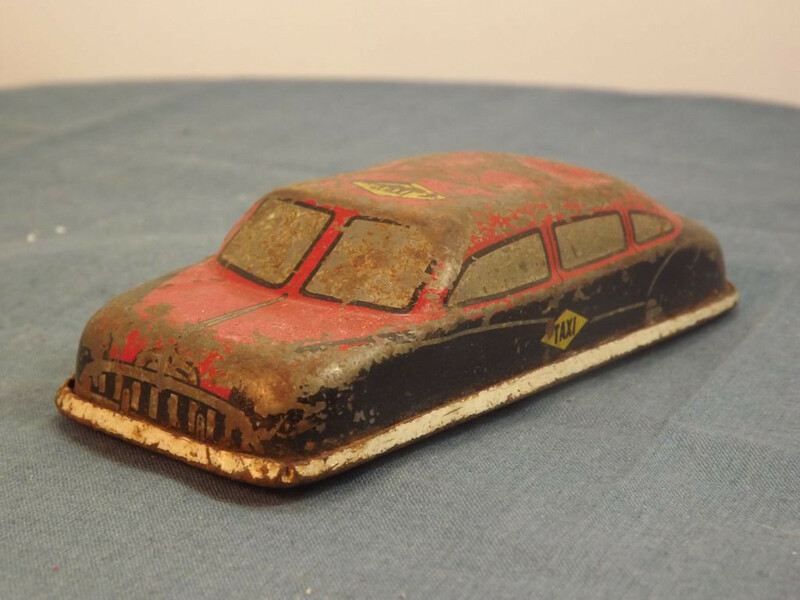 This model is the Unknown 4 Door Sedan Car in Black and Red taxi livery. 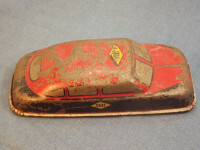 I have coded this as a UK model as it is almost identical to the Glam Toy Products of that era but it MAY be a US model. The model has a one-piece, pressed metal body, 103mm in length. It has been shaped with rudimentary representations of the body lines. There is no glazing - all the features are litho-printed onto the body. At the front are representations of the windows, head lights, and grille. To the sides there are no outlines of the doors or door handles but there is a body line and black "Taxi' in yellow diamond. The lower sides are in black, while the upper body is in red. 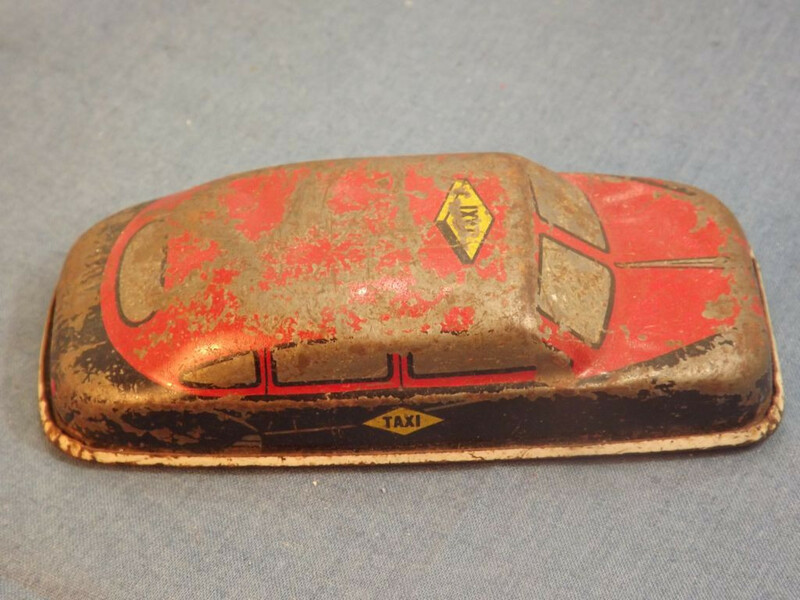 The roof is red with a black outlined panel with yellow background and black "TAXI" lettering. The rear bears a yellow "numberplate" with black lettering reading "GENERAL". Either side of this are the red rear lights. The original solid rubber wheels are still on the model, mounted on steel axles with crimped ends. The base plate is a single piece, flat, pressed tin unit. 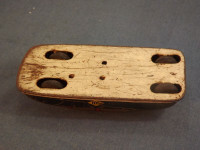 It has been press fitted to the body and the edges rolled to hold it over the edges of the body. It has been painted in a cream coating, which on this model has remained fairly well intact. There is no manufacturer's marks or country of origin details on the base. 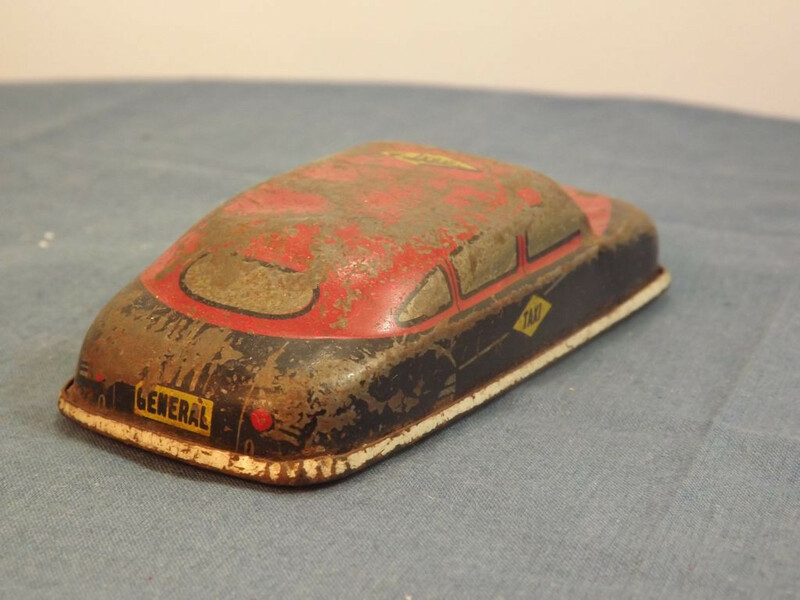 I do not know exactly when this item was issued but believe it to be the 1950s.